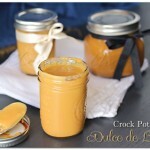 Crock Pot Dulce de Leche is an easy slow cooker caramel recipe that takes just one ingredient. 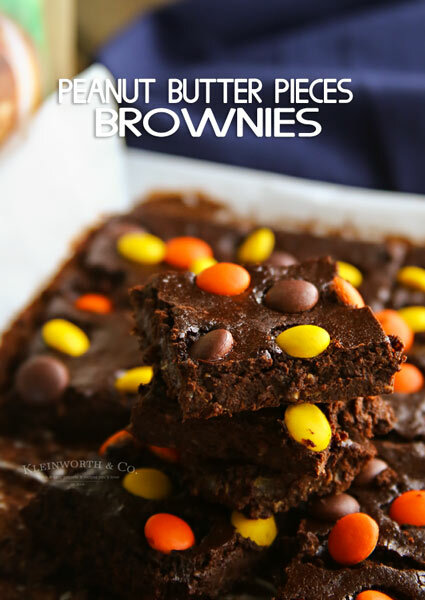 Simple to make & the perfect topping for fall desserts. 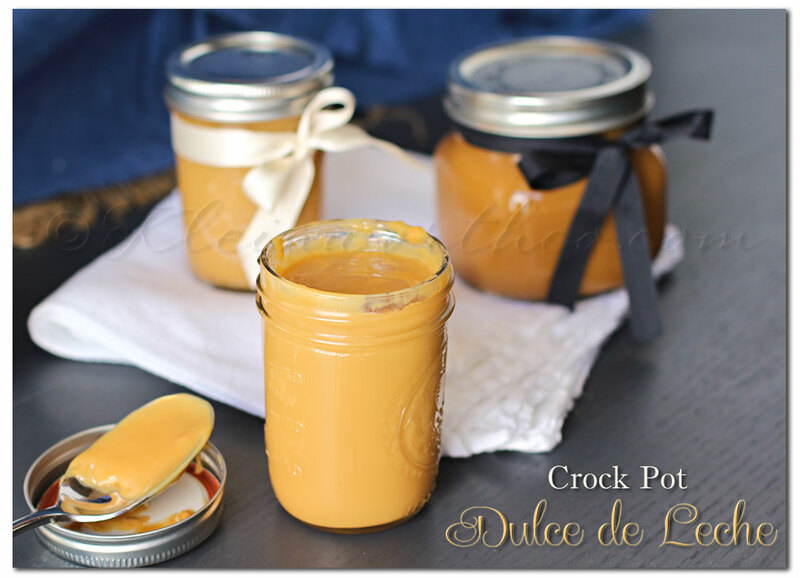 There have been a lot of different ways to make Dulce de Leche (milk caramel) floating around lately. Some of you may wonder what all the hype is about. Some of you may be hesitant to give it a try because you just don’t know how it will turn out. I did give it a try – several times. So I decided to give you my way of doing it – after trying several different ways & coming up with what I found to be the easiest way for me. I don’t know about you- but I love having caramel on hand. If I want an ice cream topping, making a new treat- whatever!! I like to have it & eliminate a step. 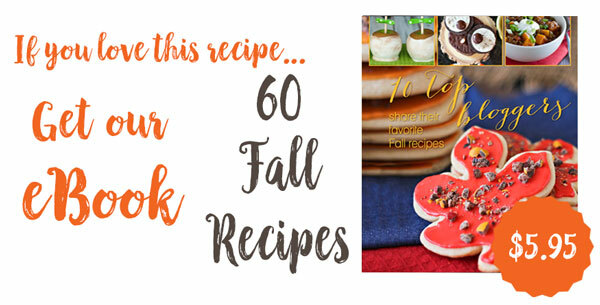 You know I like to make lots of things with caramel-(caramel recipes here) especially now that the fall season is upon us & I have an ABUNDANCE of produce at the moment. 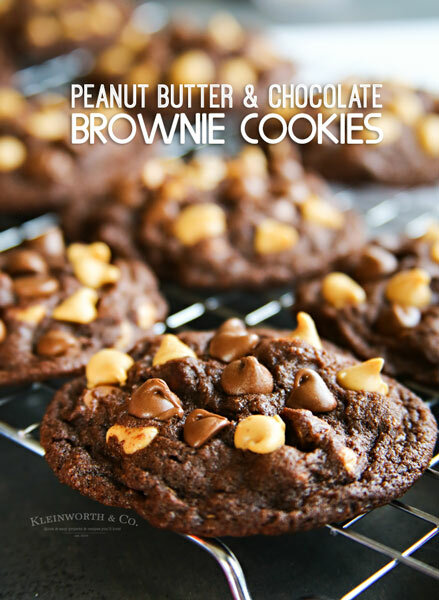 (HUGE SMILES HERE) I like this recipe because I can make several jars at a time so I always have some on hand & I can utilize my crock pot- leaving my oven open & available for whatever I may be making that day. Jars- as you can see I did different sizes. 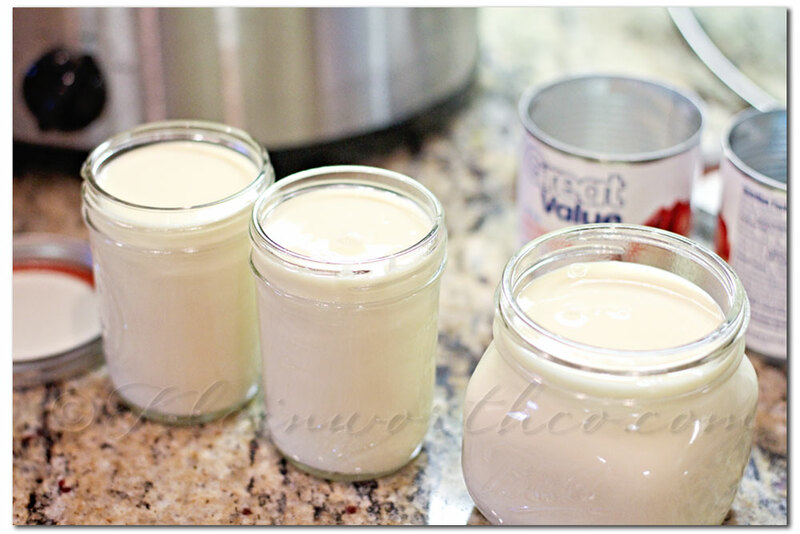 Sweetened Condensed Milk- I am showing 2 cans here but I ended up doing 3 for this. Okay- so 1 can into the big jar. Then another can that filled 1-1/2 of the little ones. Then I took the 3rd can & topped off the rest of the second small jar & then filled the big jar a bit more. Put on your lids- tightly!!! Make sure the rims are clean & clear of any dribbles first. 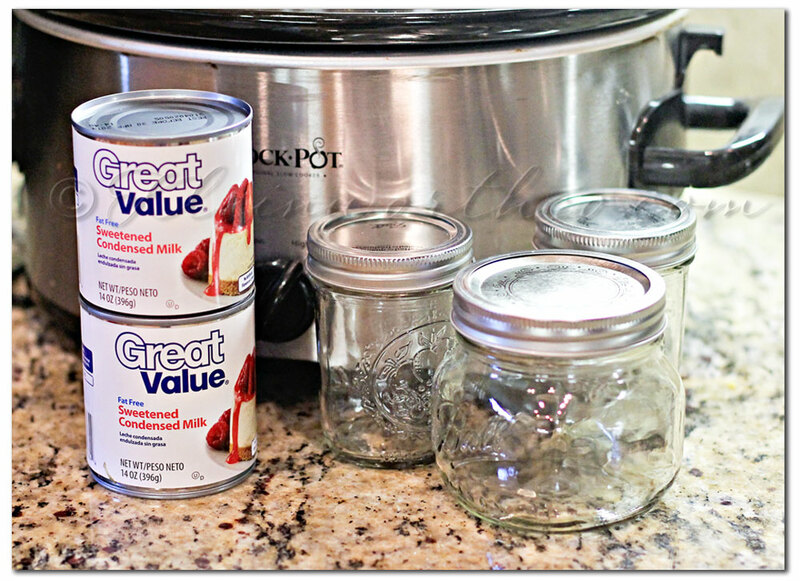 Place in your crock pot & fill with water until completely submerged. Plug in- cover- cook on high 4-6 hours. Once it’s the color you desire- remove with large tongs. Cool 60 min on wire rack & then transfer to refrigerator. For these little ones- I did 4 hours because I wanted a lighter color. For the larger one I left it in for an additional hour for a slightly darker color. The first time I did both for the full 6 hours- it was a bit deeper & thicker. I like having a variety depending on what I may need it for. 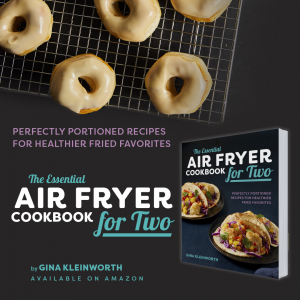 So Easy – So Good!! 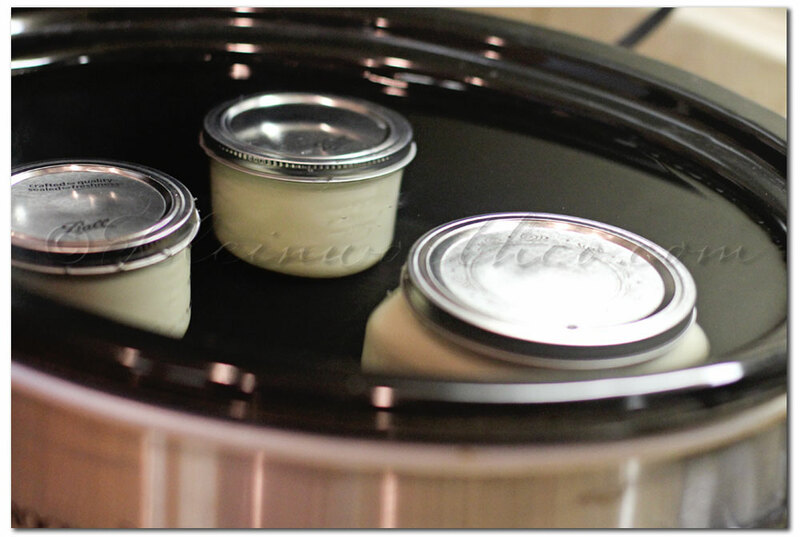 Place in the slow cooker & cover with water. Cook on high 4-6 hours or until it becomes the desired color you are after. Remove carefully & Allow to cool on wire rack 1 hour. Serve hot or store in the refrigerator for 2 weeks. Did you not realize that evaporated milk is dairy, and its not safe to can dairy? Please adjust your recipe accordingly…..try freezing it for long-term storage. Thank you for your comment Monica. 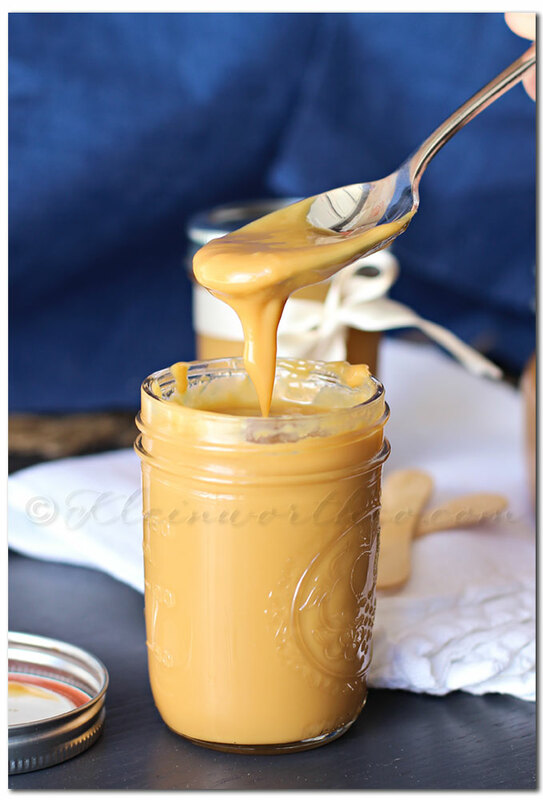 I did not state that this recipe could be stored un-refrigerated as this is not a recipe for canning the sweetened condensed milk/ caramel. The water is for cooking it in the crock pot to turn it into caramel- one could also cook for less time in boiling water on the stove top. Recipe clearly states that it should be stored refrigerated. Freezing is an option but we definitely use it too fast for needing to do that. I usually make it as needed. Oh, my yumminess! I have made this by boiling the cans in a pot for several hours, but something just feels wrong about it, even though it tasted amazing. I like your method a lot better. I’ll be trying this soon! 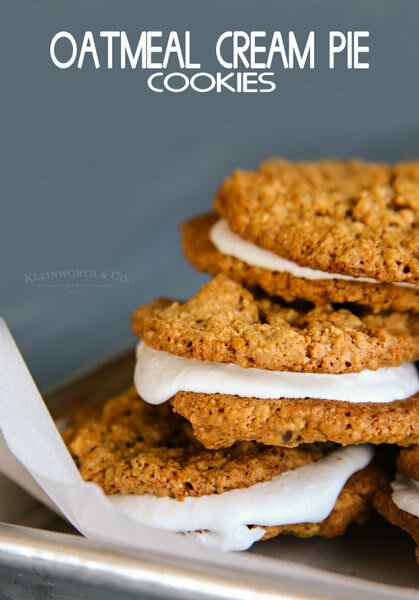 I’d love for you to link this up to our All Things Thursday Blog Hop that’s going on right now. I hope to see you there! I’ve never made Dulce de Lecheso I’m sorry if this is a stupid question… the sugar in the milk carmalizes? And that’s it? Omy omy omy! How wonderful is this? Hi Mary- yes- the translation is Milk Caramel- so it’s caramelized sweet milk. Or a thicker caramel- very tasty. Hope you try it.